Although it was some 2,500 years ago when the great Athenian philosophers Plato and Aristotle became the first westerns to ponder the mysteries of life from a psychological perspective, it wasn’t until the 19th century, not long after the immortalized French medical doctor Pierre Cabanis began speaking about a science of man, when the field of psychology was recognized as a distinguished area of scientific study. While the discipline’s history has been brief in comparison to many of the world’s other esteemed academic subjects, this by no means is to say that the field’s evolution has progressed slowly. In fact, ever since the late 1800s, each passing decade has unfailingly given rise to a number of influential psychologist near Hornslet and Rosenholm Castle who’ve systematically improved our understanding of the brain and human behavior. 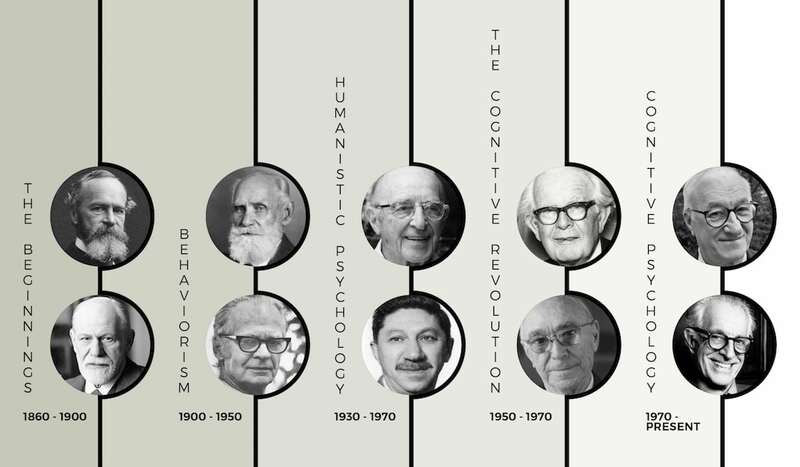 Thanks to the work of these legendary figures, who’ve conceptualized a variety of enduringly significant psychological theories and developed a valuable base of psychological approaches, the field has not only become one of the world’s fastest growing but also one of the most important. Here, we’ve done our best to illuminate the most notable contributions and wisdom filled words of ten historically significant psychological figures, coming from the schools of Psychoanalysis, Behaviorism, Humanistic and Cognitive, while simultaneously outlining the evolutionary path of the field. Before we begin this exploratory journey, it should be pointed out that because this article looks at the discipline’s greatest minds from a historical lens, we’ve regrettably had to omit nearly all of this generation’s most influential psychologists. Doing so, however, certainly wasn’t done with the intention of diminishing the importance of the momentous contributions made by individuals such as Daniel Kahnman, Martin Seligman, Howard Gardner and Barbara Fredrickson. With that being said, let’s now turn our attention towards two of psychology’s earliest influencers. Wilhelm Wundt (sitting) with colleagues at the University of Leipzig. To accurately explore the historical roots of psychology, we must begin our journey by traveling back in time to Germany during the 1860s and 70s. It was here where the iconic psychologist Wilhelm Wundt, the man most consider to be the father of the field, taught the first higher education psychology course at the University of Heidelberg in 1864, published the first book pertaining to the discipline, Principles of Physiological Psychology, in 1874 and opened the first experimental psychological lab at the University of Leipzig in 1879. It wasn’t long after Wundt, who aimed to dissect psychological matters down to their smallest parts by employing the perspective of structuralism, helped establish the field as an area of scientific study, a number of other eminent figures, such as Gestalt Psychology’s founding father Max Wertheimer, took on prominent roles influencing the field. Yet still, there are perhaps no two figures from the discipline’s earliest years who influenced the study of the brain and human behavior like William James and Sigmund Freud. Where as Wilhelm Wundt is rightfully thought of as the father of the broader psychological field, the late great William James (January 11, 1842 – August 26, 1910) is more specifically remembered as the founding father of American psychology. Of course, this is because it wasn’t long after the aforementioned Wundt taught the first university psychology course on European soil and wrote the discipline’s first important book when James followed a path remarkably similar to his colleague from across the pond. It was in 1875, to be exact, when James taught the first American psychology course at Harvard University and in 1890 when he’d publish what would become one of the field’s earliest classics, The Principles of Psychology. There is perhaps not a single individual who’s impact on the field of psychology, and the world at large, can match that of the iconic Austrian psychologist Sigmund Freud (May 6, 1856 – September 23, 1939). While many of his most notable theories, on topics such as the ego, sexual libido and the relationship between a mother and child for example, have been sharply criticized and thoroughly debunked by the influential psychologists who came after him, there’s little doubt that his work remains important and his historical influence will forever hold weight. Moreover, although some of history’s most important psychological movements originated out of opposition to Freud’s work, the polarizing psychologist mentored a number of other historically notable psychologists including Alfred Adler, Carl Jung and his daughter Anna Freud. Not long after the psychological approach of psychoanalysis emerged as the field’s first dominant perspective, a second major school of thought arose out of opposition to Sigmund Freud’s theories which placed great emphasis on understanding the introspective nature of human experience. It was in the early decades of the 1900s when the work of a number of historically influential figures such as Edward Thorndike and John B. Watson shaped the behavioral perspective that aims to limit psychologists’ focus to only behavior. It was largely because psychologists at the time were struggling to objectively understand the subjective nature of the mind that Behavioral Psychology rose to prominence throughout the first half of the 20th century. While Thorndike’s law of effect, which he publicly presented in 1898, marked one of the first major contribution to the behaviorist movement, and Watson, who carried out the famed Little Albert experiment, formally established the behavioral school in 1913, the work of two other behavioral giants may have had the greatest impact on the broader field. Throughout the 150 year history of psychological exploration, few experiments have stood the test of time as being truly groundbreaking and even fewer that’ve used animals as the subject of the research. Undoubtedly, one such experiment that did just that was carried out by the great Russian psychologist Ivan Pavlov (September 14, 1849 – February 27, 1936). It was during the later years of the 19th century when Pavlov accidentally discovered classical conditioning, the term used to describe the process of unintentionally developing habitual biological responses to previously neutral stimuli in the environment, while he was studying the physiology of digestion in his pet dogs. While there were a number of influential psychologists who helped develop and popularize Behavioral Psychology, the man who unquestionably became the face of the movement was B.F. Skinner (March 20, 1904 – August 18, 1990). Similar to Ivan Pavlov, who made an important discovery about the development of habitual behavior that stood the test of time, so too did Skinner with his theory of operant conditioning. Where as the iconic Russian psychologist’s discovery related to involuntary biological responses and neutral environmental stimuli, however, the immortalized American’s findings revealed a distinctive type of conditioning that develops when individuals learn to associate positive and negative outcomes with their actions. Over time, these associations, which encourage and discourage particular behaviors, are strengthened through what Skinner called reinforcement. Up until around the 1930s, the two psychological approaches of psychoanalysis and behaviorism largely shaped the field’s understanding of the brain and human behavior. That was until Humanistic Psychology emerge as psychology’s third major school of thought in response to the limitations of the work done by Freud, Skinner and others. In stark contrast to the pessimistic perspective of psychoanalysis and the restrictive view of behaviorism, the humanistic approach was built upon the notion that all individuals are inherently good and have the ability to move themselves towards happiness and fulfillment. While the two iconic humanistic psychologists that we’ll examine below, Carl Rogers and Abraham Maslow, are widely thought of as the movement’s most important figures, a number of other influential psychologists contributed to the holistic approach which focuses on ideas such as human potential, subjective experience, creatively becoming and finding meaning. For example, the work of Otto Rank, Viktor Frankl, Rollo May, Fritz Perls and Laura Perls were all of great importance to the field. Thank to this distinctively optimistic branch of psychology, other prominent subfields, such as Transpersonal Psychology and Positive Psychology, and therapeutic strategies, such as Gestalt Therapy and Existential Psychotherapy, have come about. When examining the psychological contributions made by history’s most influential psychologists, it becomes clear to see that few individuals have been able to impact the field like Carl Rogers (January 8, 1902 – February 4, 1987). Not only is late great American psychologist considering to be one of the founding father of Humanistic Psychology, and therefore a grandfather figure of Positive Psychology, he also revolutionized the field with his Person-Centered Therapeutic Approach. While the great minds before him had confidence in diagnosing their patients and prescribing solutions to fix their problems, with almost a sense of arrogant superiority, Rogers’ approach, which was outlined in his highly acclaimed 1951 book Client-Centered Therapy, was based upon the belief that the psychologist and client are equals. Therefore, instead of making assumptions based upon the limited amount of time they spent with their patients, Rogers advocated for listening, understanding and guiding them towards the discovery of their own answers. Throughout modern history there have been a plethora of iconic figures, coming from a wide variety of backgrounds, who’ve rose above distressing life circumstances to inspire others and bring positive change to the world. As was the case with Abraham Maslow (April 1, 1908 – June 8, 1970), it was the disheartening years of his youth, and later the devastating effects of the second world war, that gave rise to a modest yet brilliant man. Although he didn’t have a supportive environment at home, dealt with anti-Semitic racism throughout the younger years of his life and even was diagnosed as being ‘mentally unstable’ by a therapist, the now immortalized humanistic psychologist was able to transform the field by shining light on humans’ positive traits. Unquestionably, Maslow’s most notable contribution came in the form of his Hierarchy Of Needs theory which systematically outlines the psychological needs an individual must appease in order to achieve the ultimate human desire to realize one’s fullest potential, or what Maslow called self-actualization. While the psychological approaches of psychoanalysis, behaviorism and humanism dominated the field until the later decades of the 20th century, the 40 years between 1930 and 1970 served as a vastly important evolutionary period for the discipline’s future. Not only was it during these four decades when the branches of Developmental Psychology and Social Psychology were formally established, but it was also during this time period when a variety of influential psychologists commenced the movement known as the cognitive revolution. By coming to discover a wide range of flaws with the theories and methods found within the psychoanalytic and behavioral schools of thoughts, prominent psychologists such as Lev Vygotsky and Leon Festinger, who were both highly critical of their predecessors, were able to stoke the field’s interest in studying the functional role mental processes play in the human experience. Additionally, the work of others such as George A. Miller, who’s 1956 article The Magical Number Seven, Plus or Minus Two remains one of the field’s most cited, and Noam Chomsky, who adamantly rejected B.F. Skinner’s idea of radical behaviorism, undoubtedly helped transform the discipline. Yet still, while these immortalized figures certainly propelled the field forward, it’s hard to overlook the groundbreaking work of Jean Piaget and Jerome Bruner. Although it’s said that the cognitive revolution started in the early 1950s, it’s nearly impossible to separate the work that developmental psychologist Jean Piaget (August 9, 1896 – September 16, 1980) conducted in the 1930s from the greater psychological movement. In fact, because the celebrated Swiss psychologist was the first to systematically study the process of mental development in children, it’s safe to consider him as one of the revolution’s earliest pioneers. Certainly, his most notable contribution to the field comes in the form of Piaget’s theory of cognitive development which tells us there are four distinctive developmental stages (the sensorimotor stage, the preoperational stage, the concrete operational stage and the formal operational stage) that children progress through as they actively expand their intellectual dexterity. In comparison to the late great Jerome Bruner (October 1, 1915 – June 5, 2016), there is perhaps not a single individual who did more to usher in psychology’s cognitive era. It was after becoming discouraged with the field’s dominant approach of behaviorism in the 1940s when the iconic psychologist first began studying the human mind and his contributions over the following two decades would prove to be invaluable to the development of the cognitive approach. Not only did Bruner’s groundbreaking research on the active processes of perception and sensation open up a new avenue for psychological study, but his 1956 book A Study of Thinking and his role founding the Harvard’s Center for Cognitive Studies in 1960, alongside colleague George A. Miller, were undoubtedly significant to the cognitive revolution and the formalization of Cognitive Psychology. Ulric Neisser (right) with Jacob Beck. With the pioneering work of Jean Piaget, Jerome Bruner and others like Allen Newel as a foundational base, psychology’s fourth major school of thought emerged around 1970. It was in 1967, to be exact, when the man who’s commonly thought of as the father of the cognitive perspective, American psychologist Ulric Neisser, published his groundbreaking book Cognitive Psychology and moved the new approach to the forefront of the field. While the world’s most influential psychologists remained interested in studying observable behavior after Neisser’s landmark work, Cognitive Psychology would gradually become the discipline’s most prominent branch. Within the later decades of the 20th century, the cognitive approach has vastly increased our knowledge of the brain and human behavior as a plethora of distinguished psychologists, who study our brain’s hardwiring as if it were a computer, have made historic discoveries related to a variety of mental processes such as thinking, perception, memory and judgment. Still till this day, the likes of David M. Buss, Elizabeth Loftus and Steven Pinker continue to deepen our understanding of the mind as some of the field’s most celebrated figures. Yet still, throughout the branch’s brief history, there have been few cognitive psychologists who’ve influenced the perspective more so than Albert Bandura and Albert Ellis. While there is no denying the fact that the distinguished American psychologist Albert Bandura (born December 4, 1925) played a major role in stoking the cognitive revolution and subsequently shifting the field’s dominate perspective from behavioral to cognitive, his numerous contributions have spanned across a 60 plus year career and much of his most important work has occurred after Cognitive Psychology was formalized as one of discipline’s major branches. Bandura first became a household name in 1961 after conducting his now legendary Bobo doll experiment that showed how children learn behaviors by observing and imitating older adults. From this research, the influential social cognitive psychologist developed the social learning theory which he later expanded, to give a more comprehensive view of the relationship between cognitions and socially learned behaviors, and renamed as the social cognitive theory. Just as the aforementioned Albert Bandura can be considered as one of the truly distinguished figures of the cognitive revolution, so too can the iconic American psychologist Albert Ellis (September 27, 1913 – July 24, 2007). Similarly, just as Bandura’s work impacted the field far beyond the initial phases of the field’s evolution towards Cognitive Psychology, so too has the work of the man Psychology Today proclaimed as having the greatest impact on modern psychotherapy. It was in the late 1940s when Ellis, who believed that each of us can cultivate happiness and fulfillment within ourselves, broke away from the conventional therapeutic approach of psychoanalysis and began developing a new method that blended cognitive, emotional and behavioral strategies. By the mid 1950s, the iconic psychologist had gone public with his new approach of Rational Emotive Behavior Therapy (REBT) and begun teaching it to other therapists.